In addition to the recognition of the nominees by the artistic “National Volunteer Award” trophy, this year the Council will be allocating the sum of 1,000 euros to the nominee awarded in 1st and 500 euros each to the 2nd and 3rd placings. The monetary reward will go towards the Voluntary Organisation in which the nominees work for a particular project. Members of the general public and organisations are being asked to nominate individuals they believe to be deserving of the award. MCVS will receive nominations on e-mail mcvs.msdc@gov.mt Nomination forms can be found on the MCVS web site www.maltacvs.org or requested via e-mail. 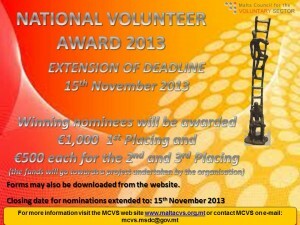 The closing date for nominations is extended to the 15th of November 2013.